Congratulations Marrickville Public – winner of the national My Park Rules competition. 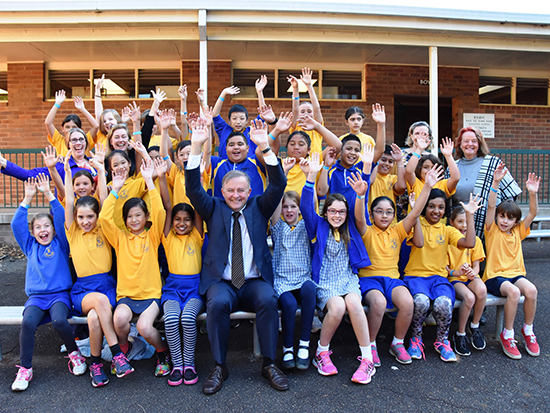 After 100 entries and 30,000 votes cast across the nation, Marrickville Public School’s entry was first judged the best in NSW, and now it is the best in the nation. The award winning design, developed by Marrickville Public students in partnership with a team from TRACT, will now become a reality. Initiatives like My Park Rules show how we can work with communities to provide well-designed parks and green spaces. We know that green spaces do more than just give us somewhere nice to play or sit in – they make us healthier, happier and provide places of reflection in our ever growing urban spaces. Importantly green spaces also cool our concrete landscapes to mitigate the urban heat island effect. In areas like the inner west our parks and green spaces make a big difference. I know how important this well-deserved win is to the Marrickville Public community. It’s a pleasure to join students and teachers from Marrickville Public, members of the inner west community, AILA and the 202020 Vision initiative for this exciting announcement today.